In August, shortly after its official announcement, I asked the question: Do we still need the Galaxy Note? The query had more to do with the Note 7’s internal and external familiarity to the Galaxy S7 Edge and whether Samsung had devalued its powerhouse phablet so as not to overshadow the flagship S line. Now, after what will likely be remembered as the worst debacle in the tech industry of the decade, the question is all the more pertinent with an answer far easier to come by. I loved the Note 7. It was the best phone I used all year, and I am saddened at its demise, but there is nothing left to say except that it’s dead. The bigger issue now is how the South Korean tech giant can recover. The damage has gone far beyond the Note line. I live in a small town where technology is often the furthest thing from the mind. Most people here don’t think about the tech world, don’t know that Google just released its first ever phone called Pixel, but they know what happened with the Note. Only, they don’t. Not fully, anyway. Like with any major news story, the details have been diluted to the bare minimum needed for comprehension. They know a Samsung phone started catching fire and exploding. The fact that it was a Note 7 and not an S7 doesn’t matter, it’s a big enough issue to lead many of them to vow to never buy a Samsung phone, or ever again if they already had. I imagine, across the country, this is not an anomaly. The large swath of the population that doesn’t pay attention to the tech industry knows what happened to a Samsung phone, even if they don’t remember the correct model name. That’s incomprehensibly bad for Samsung. But, if ever there was a company that could recover, it would be this behemoth. It’s a long way up, but it can be done. Do we still need the Galaxy Note? As sad as it is, Samsung needs to bury the Note name for good. The company will struggle to promote any of its 2017 smartphones, but I can’t imagine a scenario in which it could succeed with a Galaxy Note 8. This doesn’t mean the idea of the Note has to die, but it needs a new moniker. It could be the Galaxy S8 Pro, or S8 S Pen Edition, anything to distance the next “Note” from the explosive predecessor. Knowing Samsung, this will ultimately lead to a Galaxy S8 Edge S Pen Edition, a mind boggling name, but we can hope the company will show some restraint after its public shaming. Those in the know will be fully aware the new device is just a Note in disguise, but the general public may not be so astute, and that’s who Samsung has to concern itself with. What I’m really curious about is how much the demise will effect the larger Galaxy family. Certainly phones are the focus, but could the damage spill into tablets and other smart devices? We won’t really know that until a year from now, or longer, but as I stated at the top, I’ve heard several people state that they will no longer consider a Samsung phone moving forward, whether it has Note in the name or not. That could mean rethinking its entire mobile brand, and killing not only the Note name but the whole Galaxy line, which would truly be a shame given the amount of time and effort the company has poured into it. If ever there were a time to uproot the Galaxy and start a new universe, however, this is it. From fire, there is rebirth. A new universe can’t be built without serious planning. The absolute worst thing Samsung could do, other than release another phone with a penchant for fiery spectacle, would be to rush its timeline to make up for the mishap. Actually, that should read, rush its timeline again to make up for the mishap. Though we don’t know the specifics, partly because the company has not told us the specifics (one of the company’s many mistakes along this journey), there is a suspicion hovering over the whole ordeal that, perhaps, it didn’t entirely know what was wrong. That’s why it hasn’t told us exact reasonings, and that’s why it sent replacement Note 7s out into the world that were just as precarious as those recalled. Thus, there’s a strong possibility Samsung rushed the replacements into the market, without fully knowing the problem and how to fix it. The company cannot afford to rush this time. Instead, it should focus all its energies on making sure the next device is flawless. If it were to move ahead with a less-than-cautious timetable, it would do nothing more than signal to a large swath of the population the company didn’t take the proper time or care and was trying, primarily, to make up financial ground lost this fall. When you’re attempting to save your entire brand, not just a singular device, you cannot afford to be hasty. Many have, rightfully, pointed out that Samsung’s faltering has left a gaping opening for Google to capitalize. Mountain View was always on the road to releasing its own phone, but thanks to the Note, fall 2016 has become the perfect time for Google to jump in the ring. The Pixel, thanks to its standing as the first true Google phone and intriguing software ideas like the Google Assistant, would have been an interesting phone no matter what. With the Note off the market and the S7 half a year from its initial release, plus Apple offering an iterative and somewhat controversial new version of the iPhone, the Pixel is suddenly primed to be a dark horse hit. There’s still a lot of work for Google to do, though it seems up to the task given the amount of money it has thrown into advertising its new device. Still, there’s no guarantee the Pixel will capture the imagination of the public. We’ve not yet had a chance to experience the phone in-person, but Samsung’s hopes of the Pixel being a dud were seemingly dashed earlier this week when initial reviews rolled out. The majority are glowing, placing it among the best smartphones on the market and at the top of the Android food chain. Then again, the Note released to rave reviews as well before it went up in flames. My guess would be the South Korean company won’t be knocked off its perch as the top Android manufacturer with just one phone, but Google could do a lot to cut into its lead, and potentially put further doubt into the minds of consumers that have bought or planned to buy a Samsung phone in the next year. If there’s a competitor with a better phone that is all but guaranteed not to explode, it could sway many buyers now wary of the Samsung name. Part of my questioning whether the Note line was still viable back in August had to do with the apparent second fiddle it was playing to the S line. It seemed to me the company made it very clear which was the more important of the two products. Now, it’s obvious. The S line has always been the truer flagship device, but the forthcoming iteration is the most important phone Samsung will ever make. Not only does the string of excellence Samsung has feasted on the last few years need to continue, the S8 needs to have a feature that will make it irresistible. A little something extra that will both market well and intrigue the numerous consumers outside the tech circle. What is that feature? I’m not sure. An assistant-like component to compete directly with the Google Assistant seems unlikely and ill-advised. It has done well with interesting hardware ideas, like the iris scanner on the Note 7, and it would behoove the company to dig into its vast bag of tricks and pull out something new and fascinating. Many smartphones have been boring the last few years. With the amount of negative attention aimed at Samsung, the company can’t just release an S8 that’s a great smartphone but similar to the S7 and the S6 before it. 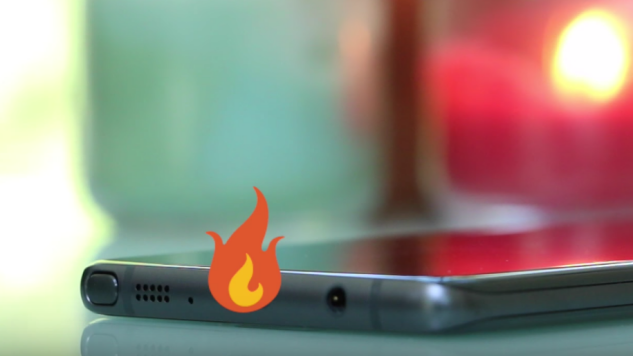 The next phone Samsung releases needs to bring the heat.